The best present we've ever been given. Mid-sentence and something that could keep up with him in each hand. "Chewbacca!" I wish I could remember why you were making this face. He loved his Duplo cars. 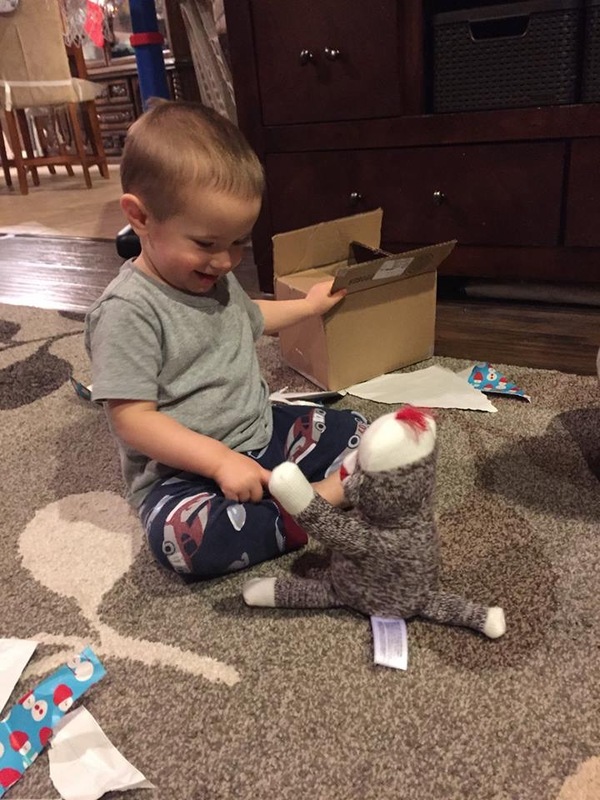 Opening his sock monkey from his Virginia family. Lens cap bandit. This is a fun toy. Look, Mom, I put it on my head just like that bow! I probably said something like "Hey, that's my lens cap!" But when you smiled at me like this, you could've had whatever you wanted. Hangin' with Uncle "Annie." — with Andy Wile. 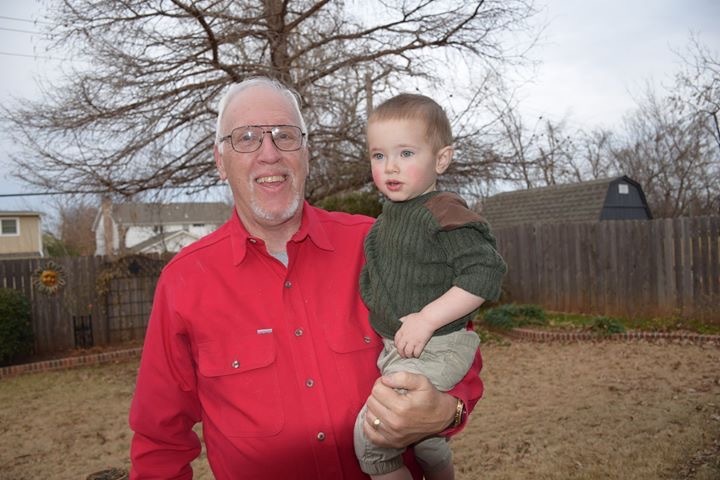 My pretty boy and his Papa. So happy to be riding in his own vroom vroom with his friends. There were sound effects coming from the driver. Visiting Grandma on Christmas. 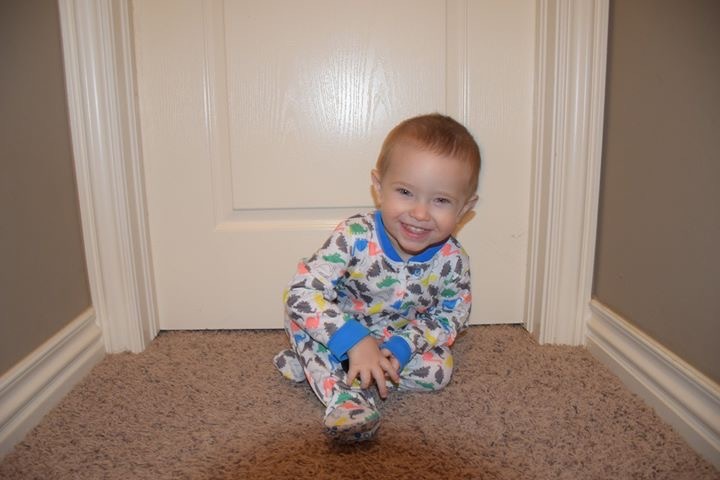 Caleb was too busy playing with his new "twactwo" to care one bit about taking a picture. #iHeartPiedmont's Hometown Holidays which presented The Caleb Effect Foundation a check for $1200 from their t-shirt fundraiser! Thank you to everyone who made this a success! 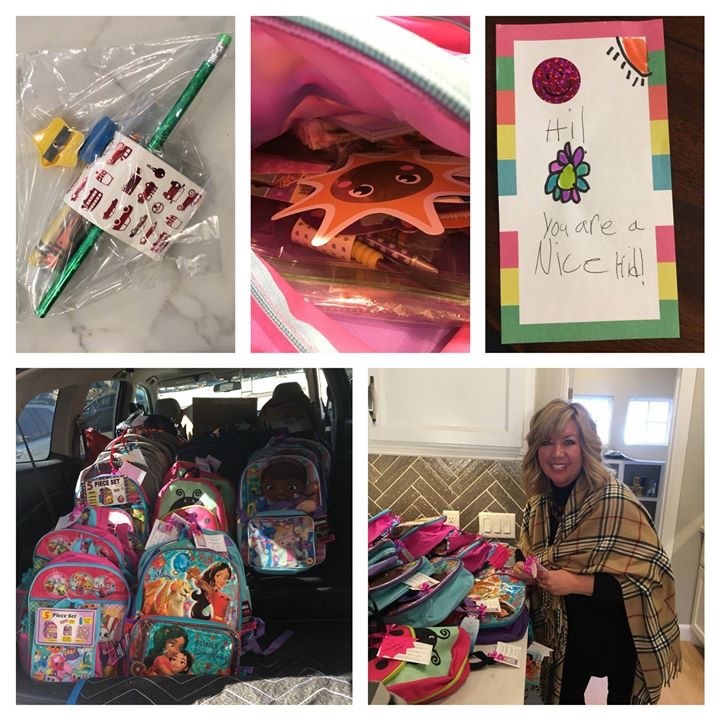 McCaleb Homes, a wonderful private donor, and so many of you who have sent us funds helped us buy 50 backpacks and lots of fun goodies for kids getting care through Angel's Foster Family Network. Academy Sports + Outdoors even let us borrow a friendly personal shopper to help us. — with Kailey A Kerr, Robin Feuerborn, Angels Foster Family Network OKC and Academy Sports + Outdoors. We had fun at our bag stuffing party! — with Robin Feuerborn and McCaleb Homes. Each bag was stuffed according to the child's age. We hope they like them. Thank you, Willingham and Reiter, D.D.S.! — with McCaleb Homes. We hope each child really knows they are loved and treasured. We did this last year and discovered a pre-teen boy saved his note. Link posted below. You never know what two simple sentences could mean to someone going through a really rough time. — with McCaleb Homes. 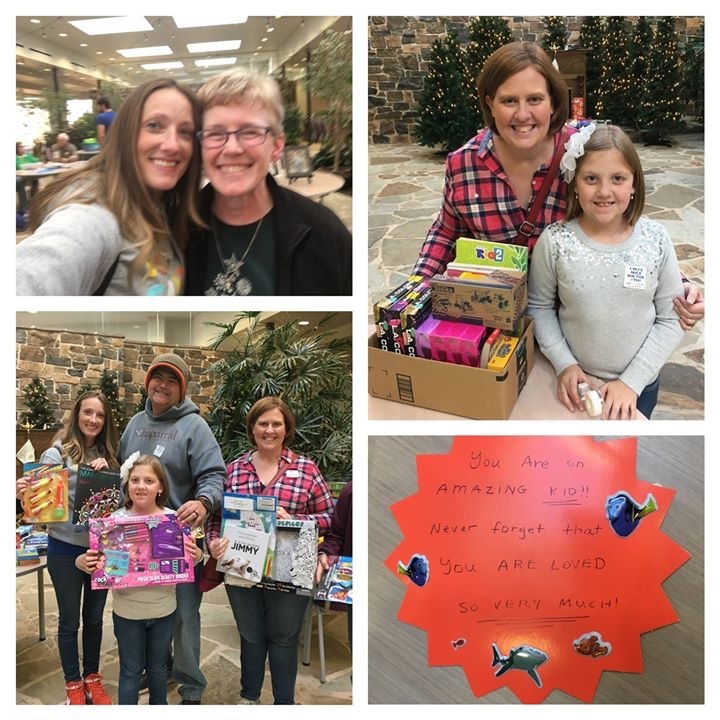 Hannah's Hope drove all the way from Perry to collect toys to share all across our state! I also found a little elf who volunteered to take donations to The Children's Center Rehabilitation Hospital! It was SOOOOOOOOOO good to see these beautiful people! Someone else was camera shy this month so her handwriting is tagged instead. Ha! — with Christy VanMeter Kukuk, Jeff Kukuk, Jennifer Goode Robinson and Ruby Willoughby Wile. They make THE BEST notes!!! Thank you, Jacob Maxfield and Kissy Padron for teaching your kids how to love others so well. We love having you with us on the 9th! — with Bernie Lindo Wile. 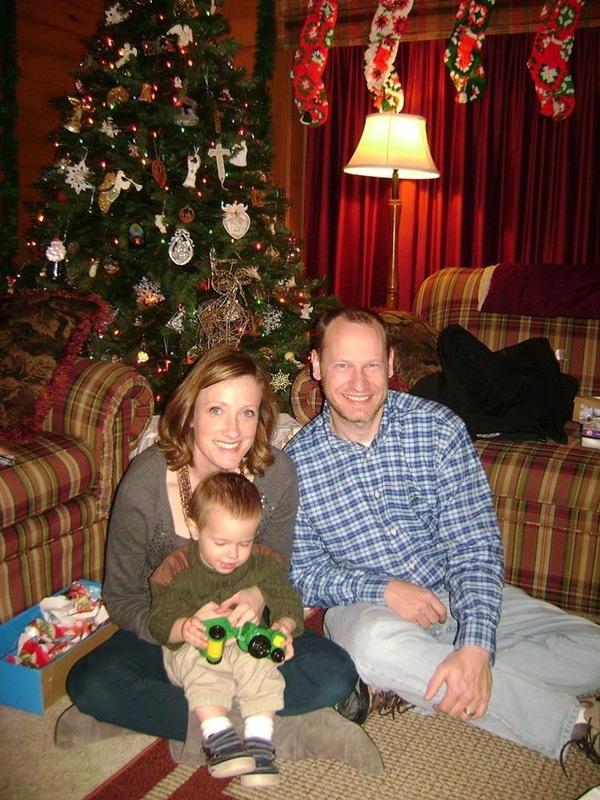 Sweetest family with some stinking adorable babies! — with Jacob Maxfield, Kissy Padron andChurch of the Servant. 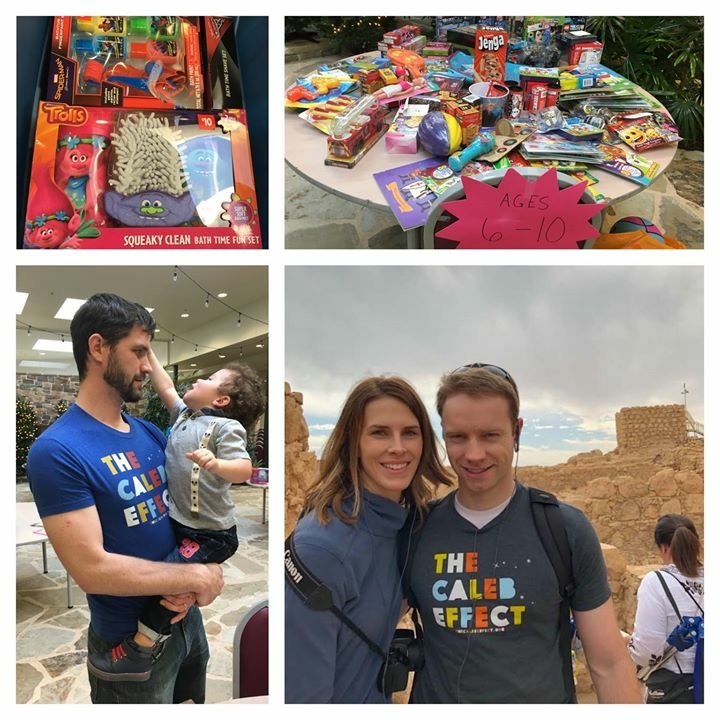 Caleb's YaYa, Ruby delivered some really fun toys and arts and crafts to Little Light Christian School, where kids have one or more parent incarcerated. Our last stop was to The Children's Hospital Volunteers where Caleb was born. Since every new patient gets to pick a new toy on their 1st or 961st visit, we sent them the majority of our collection. Belinda Anderson, check out the valet! I love it! Also, Sara Jacobson, someone is going to get THE most adorable note! Kissy and Jacob, this one was my favorite! — with Robin Hanes Khoury,The Children's Hospital at OU Medicine, The Children's Hospital Volunteers and Little Light Christian School. Nailed it! Cutest elf EVER! Hi Baby Boy. I love you my little star. You’ve been busy sprinkling your magic and excitement “alllllllll through the town.” I wish I could still sing your favorite songs with you even if you wanted the same ones sung over and over and over. Moments so simple and innocent that when I was in them I knew they were special yet still couldn’t fully cherish them the way I do now. I wished then that you would’ve picked another tune to change up the monotony (that’s when things stay the same), but every time we would finish, a little voice from your car seat and the kicking feet insisted, “Bus song! Bus song! Bus song!” Your baby cousin is older than you now and she knows this song too. She did the little motions last week and it made me wonder if you taught her to bring her index finger to her face just exactly the way you did, “shh, shhh, shhhhhhh, shh, shhh, shhhhhhh.” I hate that she doesn’t have you here to sing songs and pretend together just as I can’t stand that your other now older baby cousin doesn’t get to hide and play trains in your Thomas tent. I would love to hear the entertaining conversations you guys would be having inside your homemade box forts. I don’t think your youngest cousin could convince you to play babies with her but then again, I have a feeling you would’ve let her have her way. I wish you could still play with all of your cousins and be doted on by the bigger ones. I want the little ones to know you more than just in pictures and videos but we don’t have that option anymore. I hope you show up for them when no one else is looking. This is the time of year that used to be SO fun watching your animated face take in the wonder and lights. It was a season to take extra days away from work and spend all day together in our jammies. I will never forget your last Christmas. We wanted to let you wake up in your own room and have a quiet tradition celebrating with just you, Daddy, and me. You loved seeing the new train around the tree but you didn’t want to limit it to just going around in the same circle. We took it off the track and let it run around the kitchen floor for you, but you got scared when the clanging and lights got too close. We watched you open your presents and even captured some of these moments on video. 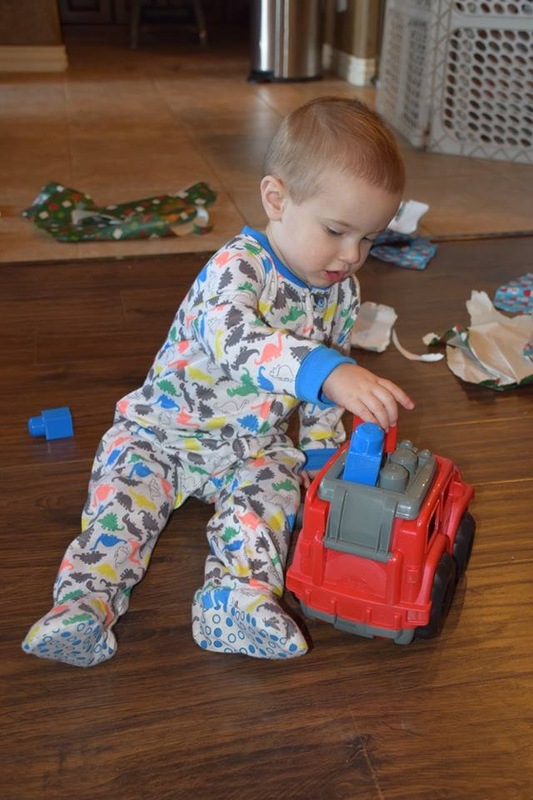 You were battling the latest daycare bug but the coughing and runny nose didn’t stop you from tearing through the paper and discovering your new, red Duplo Jeep or “Tah Wohrs” books. There were toys and puzzles put away with plans to open later but just like the Toys''R''Us gift card you never got to spend, we didn’t know the chance for “later” would never come. I hope you get all the things we were never able to give you in this life my blue-eyed boy. Caleb, you were the cutest and most loving little elf I will ever meet. It’s like you had already talked to Santa and he whispered every last desire securely tucked inside every heart. You knew how to make a soul overflow with joy and I will always wonder how you did it. December 25th will come and go, but Christmas will never be Christmas without you. I know the holiday is not just about decorations and presents but we can’t help aching with every little experience we are missing since you were stolen away from us. It hurts so much that we don’t get to buy you the things you love and it still feels like a horrible, completely unfair nightmare where we wake up gasping for air. I know life is ticking by but it’s almost like watching myself from above sometimes. It’s like a very prolonged out of body experience but maybe that’s because I really am already with you. Even so, the self that still exists in this dimension desperately wants to buy you cargo loads of every kind of vroom vroom and read you all kinds of new stories. I would make sure to make up the best voices for each character and read them as many times as you wanted. We weren’t finished doing all the things we had planned. I was taking notes on all the things I never knew were a common part of family festivities and had so many ideas waiting for December. Daddy and I were trying to ensure you really DID have the kind of peaceful celebration that a baby born in a manger brought so long ago. We were creating traditions we hoped you would love enough to carry on even after we went to live in the twinkle of your own holiday lights. I wish by some Christmas miracle you could come back even if it was just for one night. We would drive to the nearest snowy hill and get to use the bright, yellow sled we bought for you at a summer garage sale. We took it to White Sands National Monument and sent your vroom vrooms on the maiden voyage for you but it is still not the same. There is nothing I wanted to do more on your next Christmas than to ride the Polar Express as a family in our matching pajamas. Mommy has never made a gingerbread house and I was waiting to get to make our first, colorful one together. We would’ve made our own designs mixing what came in the kit and adding in a mess of frosting, brownie bites and maybe even some marshmallows. We dreamed of so many hopes and futures but there are too many moments that never came to be. You had moved up to a new class and were finally going to be old enough to go to the chapel and sing. Daddy and I couldn’t wait to watch you cheese it up at a holiday program and have the whole audience cracking up at your expressions. My little ham, you would’ve been so proud of yourself and stolen the whole show. You are still stealing the show down here whether on tv or center stage. It’s very “you” and I’m grateful for this way of sharing my little boy. However, it’s not at all in the way I wish the world could see you. I wish I could let everyone experience one of your tight hugs and pats on the back, or watch you stare a thousand full-grown deliberations into the wheels of your plastic airplane. I know I am the luckiest one in the world to have earned your affections and to have tickled my eyelashes across your laughter-filled, baby face. I was so proud to be your mommy and be the one to kiss your perfect, miniature lips more times than anyone else. All the words in the dictionary are not enough to describe how special you are, how much you are loved, or how deeply you are missed. I will die trying, but I will never be able to convey everything you will always be onto a card or quick sound bite. It makes Mommy and Daddy so sad to only be allowed our limited human constraints to sum up your superhuman, infinitely loving and treasured life. Not even showing videos and talking about you non-stop for the rest of our lives could accomplish that. Still, I hope people can still see you through us and somehow you reach them even if they never know it was you. Baby Boy, your Velcro, size 5 shoes that you haven’t worn in far too long are still here, but the tiny space your feet left remain a colossal hole I will never be able to fill. No, I can’t buy you the most amazing vroom vroom you’ve ever seen but Mommy and Daddy ARE still working on a project that we hope comes close. If everything works out, 2019 will see the creation of our final family pit stop on this planet. However, just like your personality, Mommy’s ideas were brighter than what exists in this limited Earthly world. We’ve literally searched the globe to give you this one last present and we finally found an element that fulfills my biggest request (even if it IS on a mere technicality). We’re doing our best to finish our stint but we need you to help us get it just right. You’ve been getting it right all week but Mommy hasn’t had time to tell you about it. Mommy’s home town raised money through the #iHeartPiedmont Hometown Holidays charity tees in memory of you and two other beautiful boys. I have to believe you greeted your new playmates when they arrived and you are taking turns sharing all your favorites from this world. Rhett loved “moos,” Mason adored dinosaurs, and you typically had at least one vroom vroom in each hand. 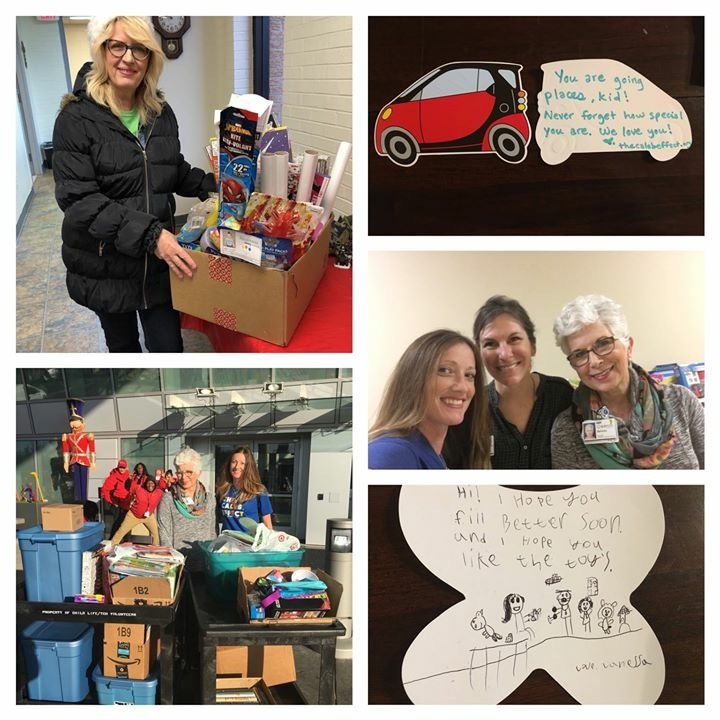 Joyce Mills Leach and her hype girls made sure Santa remembered each of your special toys on his trip to visit you from the North Pole, and some friends not much bigger than you had a ball handing out your beloved vroom vrooms to help warm the frigid air. Is it just me or is it a little ironic that AllStar Screen Printing was the generous designer and t-shirt printer, donating a majority of the costs in memory of three all stars? Because of their kindness, and the help of several sponsors (including your uncle, Lindo Paul Construction), Piedmont Public School Education Foundation and The Caleb Effect Foundation both received checks for $1200! We already have ideas brewing for a future 9th but we are thinking it will have to wait until the weather is a little warmer. Thank you! You also had a lot of love sent last week from McCaleb Homes, a very special couple, and your Caleb Effect crew. Together, we bought 50 backpacks for kids who have to leave their house and their families (many times without time to bring what they need) and live in the care of a foster family. This is the second year we have been able to send this gift to some kids who deserve a heaping dose of kindness. We tried to put things in the bags that would make them feel the love we know you are still sending. Everyone got a backpack (thank you, Academy Sports + Outdoors for being patient and lending us a personal shopping assistant); hand-written note; shampoo and conditioner; a toothbrush and toothpaste (thank you, Willingham and Reiter, D.D.S. ); a book; crayons or pencils to write or draw their feelings; a journal or notepad; toys or vroom vrooms; a stuffed animal or stress reliever; and a few things to take their minds off going to sleep in a place that isn’t familiar. We got to deliver these bags directly to Angels Foster Family Network OKC and meet Jennifer Abney and her team. They are making a big difference so it is my hope that your video sends many more helpers their way. Make everything in the bags come together to ease their young minds and let them know that so many people care about them. The weather played a practical joke on us for the 9th, but we still had a few faithful make it to be nice. 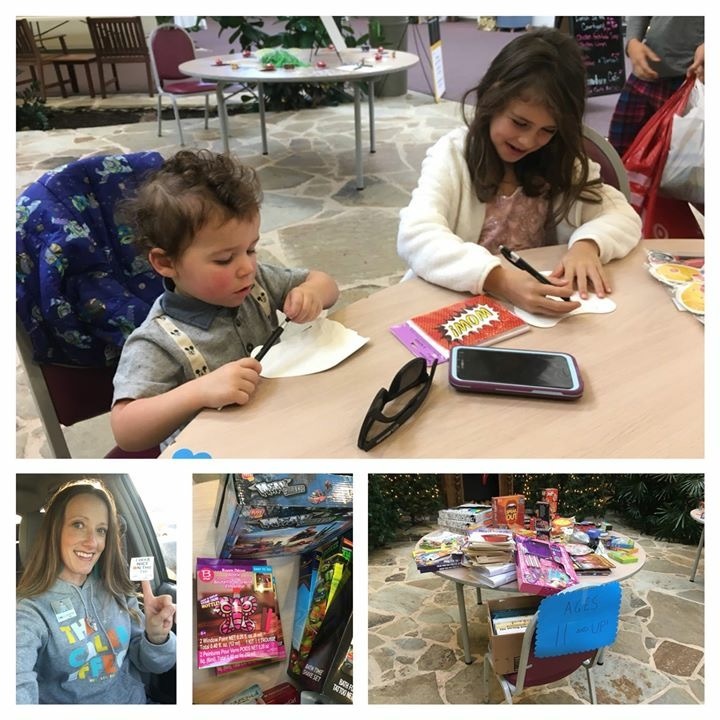 Your friends and family brought a sock monkey, board games, dinosaurs, books, and so many fun toys to give to kids. Mr. Donald Jay Cole with Church of the Servant made sure you could be seen from a prominent spot and just as he suspected, you did attract a few curious concert attendees who wanted to know more about the cheerful boy clapping for himself in the picture. We gave away the last of the presents from your friend’s 1st birthday, and also emptied every donation we had been saving from Dollar General and Family Dollar. At the end of the week, we sent or delivered toys to six different groups! The Children’s Hospital Volunteers; Little Light Christian School (for kids who have mommies and daddies who are away in prison); Noble County DHS Christmas Store; Northwest Toys for Tots; The Children’s Center Rehabilitation Hospital (thank you for the bear hug and for collecting the toys, Jennifer Goode Robinson); and The Ronald McDonald House at Children’s Hospital were our lucky recipients! We also got to make a special video to drop off toys to the hospital where you were born. We got to see Mommy’s friends, Sara Jacobson and Belinda Anderson, who have been there since Mommy was a volunteer. They make sure all the kids who have to stay in the hospital get to pick a fun gift from the toy cart. It is still hard to visit the place where you were born so Skyler and her therapy dog, "Targa,” came through at just the right time to make sure Mommy was okay. 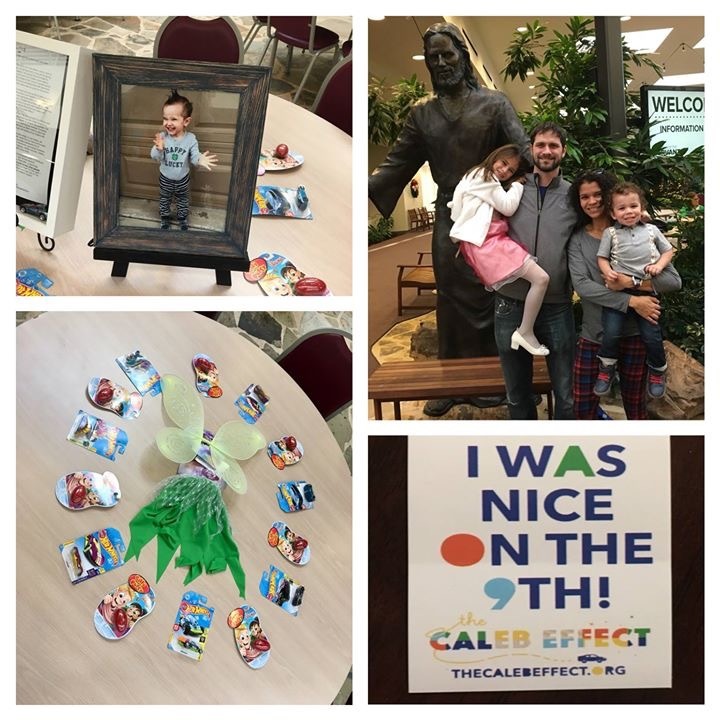 Caleb Baby, even spreading all your love and cheer far and wide, there is simply not a way to ever be as happy as we were when you were in our arms. With you, no matter what we had been through before, we had it all. When describing this to a new friend who we met through our connection with the SUDC Foundation, Julia and Wade agreed. Their daughter, Vivienne, left this life without a reason or warning as well. He and Julia know that the happiest days of life really are behind us but they are still choosing Vivienne's Joy (Vivienne's Joy Foundation) for themselves, their surviving daughter, and for Vivie. It was so good to meet others who didn’t try to paint a serene fantasy overtone and dismiss our daily struggles. 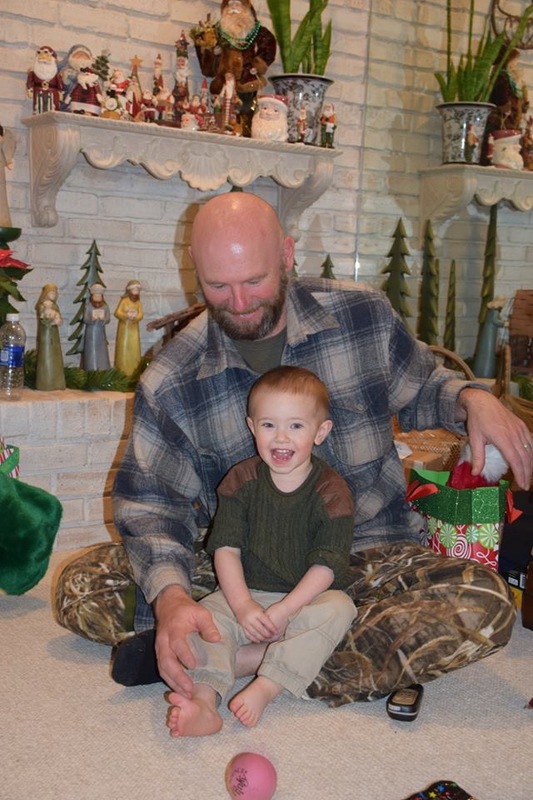 Wade explained that while we will never get back to our 100% level of happiness when our families were whole, maybe we can strive for a new high with a few 70% moments sprinkled in next to the 5% ones. I’m guessing some of the kids who will receive one of your presents will never get back to 100% either. In fact, maybe they never had a quality of life that brought them anywhere close. Whatever kind of day we are asked to face, please keep helping us have some double-digit days until we get to make it to our checkered flags too. Caleb, my beautiful boy, and Santa’s happiest helper. Wherever you are with the jolly, ol’ St. Nick, may the secrets you so instinctively knew be whispered in my ears tonight too. Even when we are struggling to make it to a measurable number even after coffee and candy canes, help me share your love you still beam down to all of us at 100%. We don’t have a stitch of decoration hanging in our house, but I hope by sending surprises to other kids it brings the true Christmas spirit you deserve. I love you, Caleb Lennon. A special thank you to Hannah’s Toy Boxes of Hope for driving so far to collect and distribute toys. You truly are bringing hope to so many who still need Hannah’s special touch.